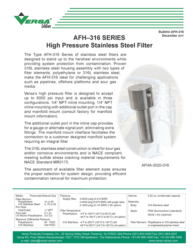 The Type AFH-316 Series of stainless steel filters are designed to stand up to the harshest environments while providing system protection from contamination. Proven 316L stainless steel housing assembly with two types of filter elements, polyethylene or 316L stainless steel, make the AFH-316 ideal for challenging applications such as pipelines, offshore platforms and sour gas media. Versa’s high pressure filter is designed to accept up to 6000 psi input and is available in three configurations, 1/4” NPT inline mounting, 1/4” NPT inline mounting with additional outlet port in the cap and manifold mount (consult factory for manifold mount information). The additional outlet port in the inline cap provides for a gauge or alternate signal port, eliminating extra fittings. The manifold mount interface facilitates the connection to a customer designed manifold system requiring an integral filter. 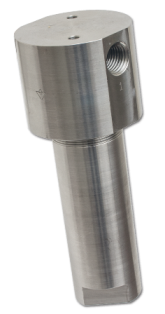 The 316L stainless steel construction is ideal for sour gas and/or corrosive environments and is NACE compliant, meeting sulfide stress cracking material requirements for NACE Standard MR0175. The assortment of available filter element sizes ensures the proper selection for system design, providing efficient contamination removal for maximum protection.